Johnston’s Mills was located on the Sauble Line (also known as the Lake Road or Highway 21) immediately south of what is now St. Joseph. Moses Johnston opened a mill on Benson’s Creek (north side of the entrance to Moore Court/St. Joseph Shores, Phase 1). A post office, under the name Johnston’s Mills, opened on June 1, 1853 and closed in 1881. Johnston was the first postmaster until 1861, when Henry Heyrock took over the role and continued until 1880. Heyrock was also the village merchant. Mail was delivered three times a week. In addition to the post office and mills, there was a hotel, school and church. William Bossenberry was the commissioner, general agent and proprietor of the Lakeview Hotel as well as the local auctioneer. The school (S.S. #11) was built on Lot 12, on the west side of Lake Road (Lake Road Concession West), north of the present entrance to Stanley Boulevard (St. Joseph Shores, Phase 2). Lakeview Church, a Wesleyan Methodist, was just south of the school. The school closed in 1896. The church closed a few years later. 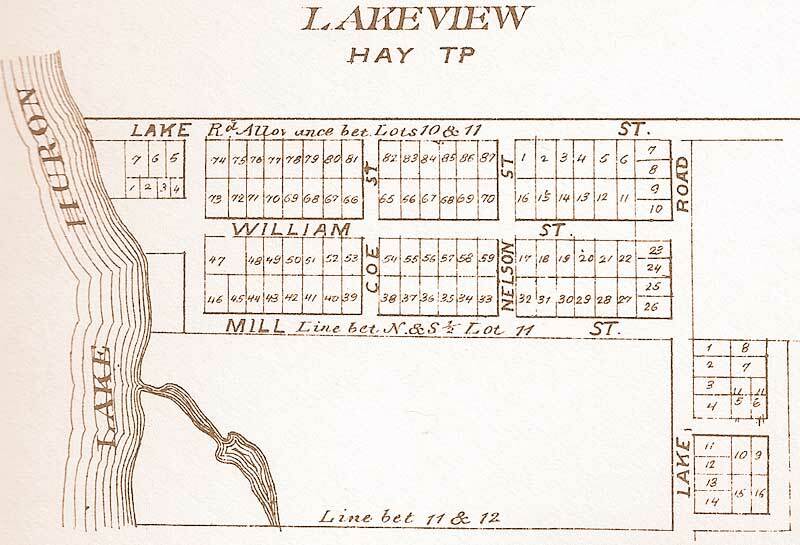 William Coe registered a town plan for the community of Lakeview, directly north of the Johnston’s Mill site on Benson Creek, March 17, 1857. Building lots were laid out just north of the mills, where St. Joseph stands today (above and below the intersection of highways 21 and 84). In 1870, the community had 50 residents. In the early 1900s, several homes, including the Johnston’s Mills school, a variety store and gas bar – all located on the southside of Benson Creek, were known as Beavertown. “Lake Road – Vallee” is today’s Highway 21. St. Joseph was to exist on either side of Highway 21 from Trudel Street, that falls south of today’s Stanley Boulevard and north to approximately Antoinette’s Line. Narcisse Cantin based the town plan of St. Joseph on William Coe’s registered Lakeview plan, but St. Joseph was to be much larger with many more streets and extending further in every direction. Street and lot surveys were closely followed by construction in 1897. The official town plan was not registered in Goderich until 1900.